Summary and Definition: WW1 or the "Great War" officially ended the state of war between Germany and the Allies when the Treaty of Versailles was signed at the Palace of Versailles in France on June 28, 1919. The terms of the Treaty of Versailles were extremely harsh towards Germany who had taken responsibility for the war. France, Britain and Italy wanted to take revenge and punish the Germans. Wilson's Fourteen Points Plan was criticized for being to lenient towards Germany and were scuttled and by the other leaders of the Allies. The terms of Treaty of Versailles detailed territorial and military changes and addressed War-Guilt provisions that demanded massive amounts of money (Reparations) as compensation for the Great War. The terms of Treaty of Versailles did however create the League of Nations as suggested in President Wilson's 14 Points. Woodrow Wilson was the 28th American President who served in office from March 4, 1913 to March 4, 1921. One of the important events during his presidency was the signing of the 1919 Treaty of Versailles following WW1. to do a bit of refereeing? The Treaty of Versailles political cartoon was published in a British newspaper showing the weight of Britain, France and Italy crushing Germany, as did the peace Treaty of Versailles. The WW1 Armistice between the Allies and Germany was the agreement that ended the fighting in the west of Europe on the Western Front. The armistice went into effect on the eleventh hour of the eleventh day of the eleventh month on November 11, 1918. The armistice ended the actual fighting on the Western Front, but it took 6 months of negotiations at the 1919 Paris Peace Conference before the terms of the Treaty of Versailles were completed. What was the 1919 Treaty of Versailles? The Treaty of Versailles was signed at the Palace of Versailles in France on June 28, 1919. The 1919 Treaty of Versailles consisted of 440 Articles setting out the terms for Germany's punishment after they had taken responsibility for the Great War that had raged from 28 July, 1914 - 11 November, 1918. There were many signers of the Treaty of Versailles, the most important being President Woodrow Wilson of the United State of America, David Lloyd George of Great Britain, Vittorio Orlando of Italy, and Georges Clemenceau of France. The Major provisions and Terms of the Treaty of Versailles detailed Military Changes, Territory Changes, War Guilt Provision (Financial Reparations) and the establishment of the League of Nations. ● The terms limited the German army to 100,000 men. ● Germany was not allowed heavy artillery or tanks. ● The German navy was restricted to 15,000 with six battleships and no submarines were allowed. ● The Germany was required to cede land to France, Belgium, Denmark, Czechoslovakia and Poland. subjected as a consequence of the war imposed upon them by the aggression of Germany and her allies." Articles 1-26: The Covenant of the League of Nations - Germany was not allowed to join. ● Article 21 was amended to include the "racial equality clause"
Article 45: The rich coalfields of the Saar were given to France for 15 years. Article 51: Alsace-Lorraine was returned to France. Article 80: Germany was prohibited from uniting with Austria. Article 87: The rich farmlands in eastern Germany were given to Poland. Article 160: The German army was restricted to 100,000 men. Article 181: The German navy was restricted to 6 battleships and no submarines. Article 198: Germany not allowed to have an air force. Article 231: Germany was held responsible for causing all the loss and damage caused by the war. 1919 Treaty of Versailles for kids: The U.S. Senate Rejected the Treaty of Versailles - "The Irreconcilables"
The Treaty of Versailles was rejected by the US Senate. President Wilson's Fourteen Points for peace had been scuttled by the Allies in the treaty who believed that they were far too lenient on Germany. There were other concerns, especially the terms relating to the League of Nations. The Senators who raised the objections were nicknamed "the Irreconcilables" in the press. 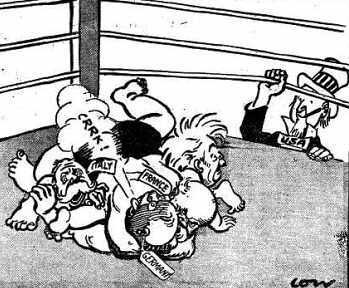 These critics, "the Irreconcilables" feared that the League of Nations would supersede the power of Congress to declare war and that the US might be forced to fight in foreign wars. 1919 Treaty of Versailles for kids: The U.S. Senate Rejected the Treaty of Versailles - "The Reservationists"
A larger group of Senators, nicknamed "the Reservationists", supported the League of Nations but would only ratify the Treaty of Versailles with amendments that would preserve the nation’s freedom to act independently. 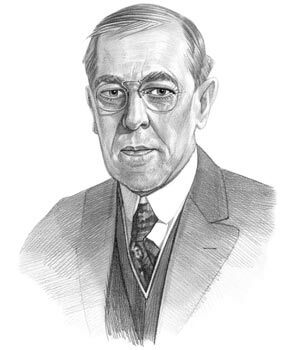 President Wilson was obviously extremely disappointed in the Treaty of Versailles but feared the changes required would defeat the basic purpose of the League of Nations and insisted that the Senate ratify the treaty without changes. The president believed he could defeat the opposition to the Treaty of Versailles, including the League of Nations, by winning public support and traveled the USA making speeches. His tour was stopped when he suffered a stroke. The Senate voted in November 1919 and again in March 1920, but refused to ratify the treaty. The USA negotiated separate peace treaties with each of the Central Powers after President Wilson left office in 1921. The United States Congress passed a resolution on June 4, 1926 that officially recognized the end of WW1 and announced the commemoration of Armistice Day as a legal holiday dedicated to the cause of world peace. The United States never joined the League of Nations although, ironically, it was America's original idea. The article on the Treaty of Versailles provides detailed facts and a summary of one of the important events during his presidential term in office. The following Woodrow Wilson video will give you additional important facts and dates about the political events experienced by the 28th American President whose presidency spanned from March 4, 1913 to March 4, 1921.